The information and content contained in this website is for preliminary and general information only and does not constitute legal, financial or other professional advice. You must not rely on any information or content contained in, or omitted from, this site without obtaining independent advice. Except to the extent that such warranties or representations are implied by law and cannot be excluded, J J Nate Real Estate & Mgmt makes no warranty or representation regarding the quality, currency, accuracy, reliability, performance, completeness or fitness for purpose of any part of the information and content on this site, or on any pages or sites linked to this site. In particular, J J Nate Real Estate & Mgmt, does not represent or warrant that the information and content on this site, or the facilities that make it available, will not cause damage, or are free from any computer virus or any other defects or errors, or that your access to the site will be uninterrupted. To the maximum extent permitted by law, J J Nate Real Estate & Mgmt, is not liable (whether in contract, negligence or otherwise) for any loss or damage arising from the use of this content and information. J J Nate Real Estate & Mgmt is not responsible for the information or content of any site accessed, or linked to, via this site or any of our electronic communications. Links to other sites are provided for convenience only and do not represent any endorsement, sponsorship or approval of the products or services offered by the site owner or the information or content on such sites. The subject matter on, and accessible from, the J J Nate Real Estate & Mgmt website is the subject of copyright protection. With the exception of fair dealing permitted by the Copyright Act 1968, J J Nate Real Estate & Mgmt grants users of the site permission to download and display J J Nate Real Estate & Mgmt copyright material only for private purposes. For any other reproduction or use of J J Nate Real Estate & Mgmt copyright material, permission must be sought directly from J J Nate Real Estate & Mgmt. If provided, permission will be subject to the requirement that the copyright owner’s name and interest in the material be acknowledged when the material is reproduced or quoted, in whole or in part. Unless otherwise stated, J J Nate Real Estate & Mgmt does not warrant or represent that the information on other websites does not intentionally infringe the intellectual property rights of any person anywhere in the world. 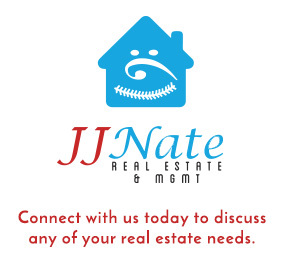 J J Nate Real Estate & Mgmt receives product information, product images and other information contained on this site from a wide variety of sources which include but are not limited to product manufacturers, vendors, news outlets, and search engines. Please notify us of any specific copyrighted images or content found on our site (click here to email) and we will be happy to remove the content. Services referred to in this site are only available in the United States and in some cases may only be available in a particular State. Unless otherwise stated, nothing in this site constitutes an offer for the supply of goods or services, or a promise or representation that J J Nate Real Estate & Mgmt will supply any goods or services.